Citizen activism has achieved many positive results. But the road to success for social movements is often complex, usually lasting many years, with few guides for evaluating the precise stage of a movement’s evolution to determine the best way forward. Doing Democracy provides both a theory and working model for understanding and analyzing social movements, ensuring that they are successful in the long term. 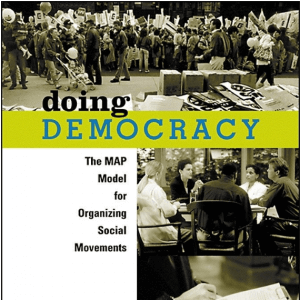 Beginning with an overview of social movement theory and the MAP (Movement Action Plan) model, Doing Democracy outlines the eight stages of social movements, the four roles of activists, and case studies from the civil rights, anti-nuclear energy, Central America, gay/lesbian, women’s health, and globalization movements.